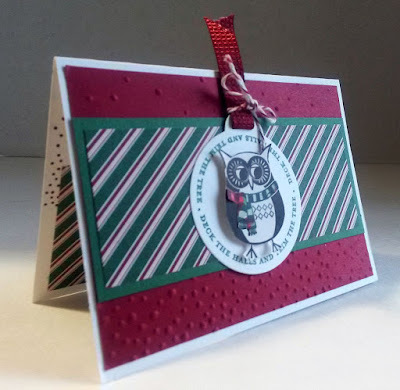 Recently I had stamped a bunch of the owls and foxes from the hostess set, Cozy Critters, in the current Holiday Catalog (page 3). 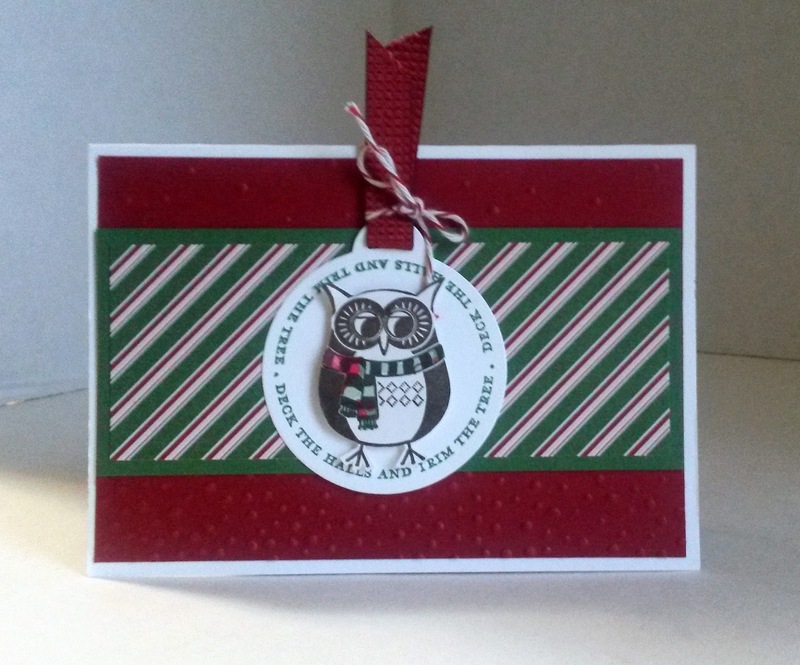 I'd stamped the owls and foxes on Whisper White cardstock. 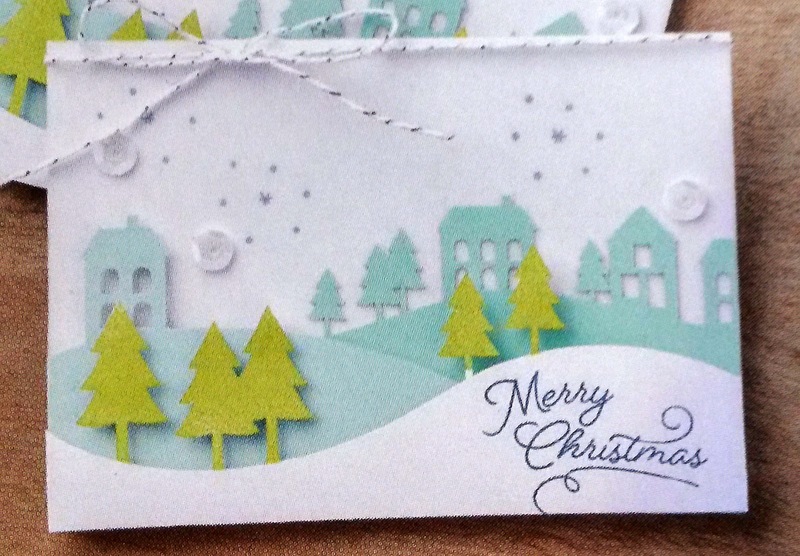 However, I stamped their coordinating scarves on teeny scraps I had of Christmas Designer Series Papers. So I had a lot of cutting to do! Yay! I must have gone a bit overboard though because I had, oh, about 40 of the owls and foxes and even more of their coordinating scarves. At my November Stamp-In workshop, my girls made cute gift card holders, using either one of my precut owls or foxes. The gift card holders are fairly small -- only 3 1/2" x 5". Showing the inside of my sample. One of my workshop attendees noted, however, that I'd missed one of the supplies that was needed to make this project: the gift card! Ah, good one. I'd told her that she could have the one in my sample (it had already been used. I just wouldn't let my husband throw it away!). Once the girls chose whether they wanted to feature the owl or the fox, they chose the coordinating scarf to glue in place. A view that shows both the outside and the inside simultaneously. Fold a 5" x 7" piece of Whisper White cardstock in half, creasing well with a bone folder. Run a 3 1/4" x 4 3/4" piece of Cherry Cobbler cardstock through the Big Shot inside the Softly Falling embossing folder. Adhere this piece to the card base. Choose a piece of Christmas-y Designer Series Paper, and cut it to 1 3/4" x 4 1/2" and 2" x 4 1/2". Adhere the 1 3/4" x 4 1/2" piece to a 4 3/4" x 2" piece of Garden Green cardstock. 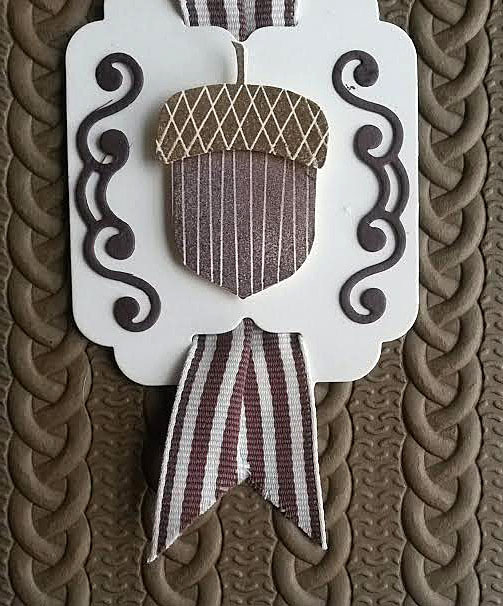 Attach this piece to the card front, raising it just a bit from center. On a scrap of Whisper White cardstock, stamp the circular words in Garden Green. Cut it out with the appropriate Framelit. Choose either an owl or the fox, and the scarf to match whichever one you pick. Adhere the scarf to your choice. Add your critter to the center of the circle with a Stampin' Dimensional. Thread a piece of Cherry Cobbler ribbon about 5"-6" long through the top of the round tag. Hold the ribbon ends together with a bow tied around the base made of Cherry Cobbler Baker's Twine. Glue this finished circle to the card front. Inside the card, stamp the falling snow on the bottom portion right under the crease in Cherry Cobbler ink. Add Tear & Tape as close to the two short and one long edges of the remaining piece of DSP. With the 3/4" Circle Punch, punch a half circle in the untaped edge. 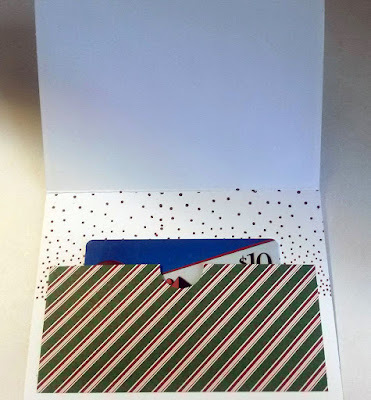 Remove the covering from the tape strip and adhere it inside the card. Insert a gift card, and you're all set for gift giving! Even though this card is a bit smaller than traditional, it will fit nicely within a regular A2 size envelope. 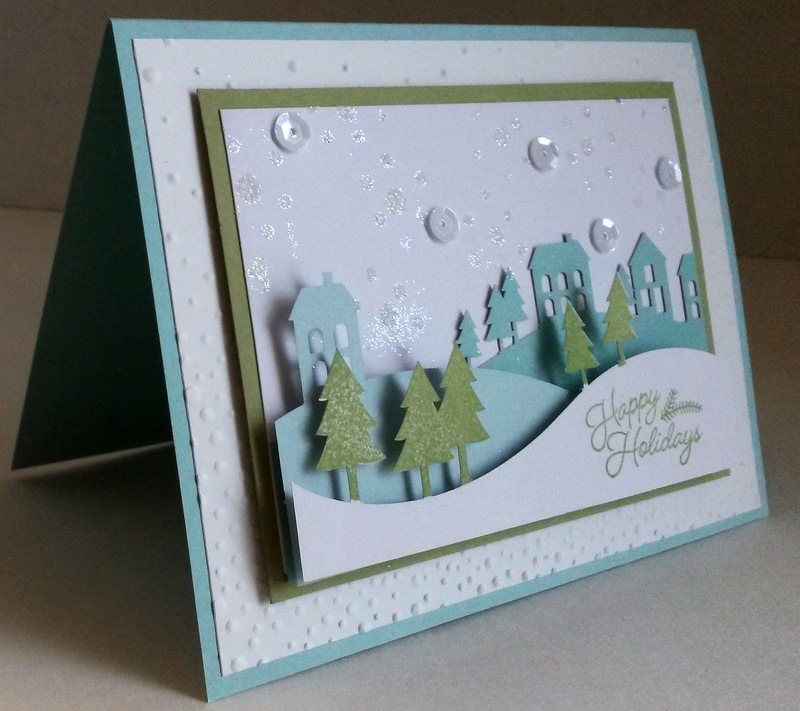 Otherwise, you could use the Envelope Punch Board to make a custom envelope that fits the card perfectly! 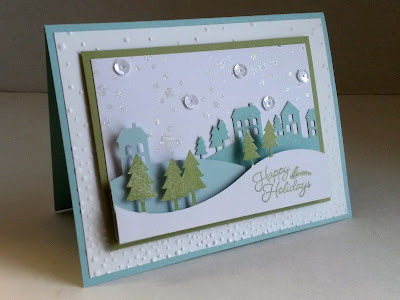 When my Paper Pumpkin kit, Wonderful Winterland, arrived the other day, I was immediately enamored, and wanted to get to work on it right away. I hastened down to my Creation Station and ripped into the package. The stamps that came with the kit were so cool, and I realized that I could use them for so much more than just what they were intended. Then I looked at the instruction sheet that always accompanies each kit. The cards were TINY, measuring only 3" x 4 1/4". No! The possibilities were much too precious to only make note-sized cards. 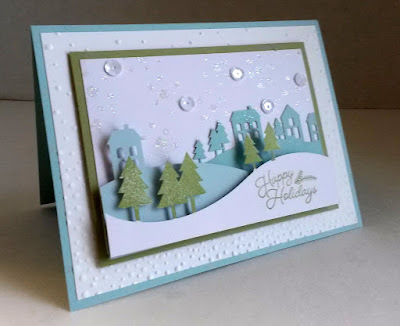 Besides making the card larger, another of the changes I wrought was that I stamped my snowflake modules in the sky with VersaMark ink and sprinkled them with Dazzling Diamonds Glitter, instead of with ink as the directions instructed. I also eliminated the baker's twine that was wrapped around the top of the card. I added a layer of Pear Pizzazz cardstock as a mat underneath the scene. 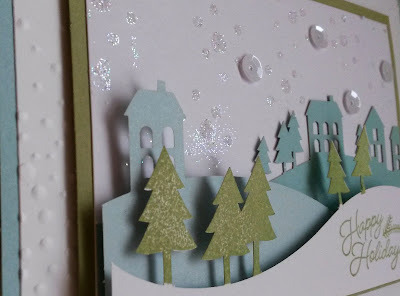 That was placed on top of a 4" x 5 1/4" piece of Whisper White that I'd embossed with the Softly Falling embossing folder in keeping with the Wonderful Winterland theme. Finally, I added it to a Soft Sky card base to make it a full-sized 4 1/4" x 5 1/2" card. And I was happy. 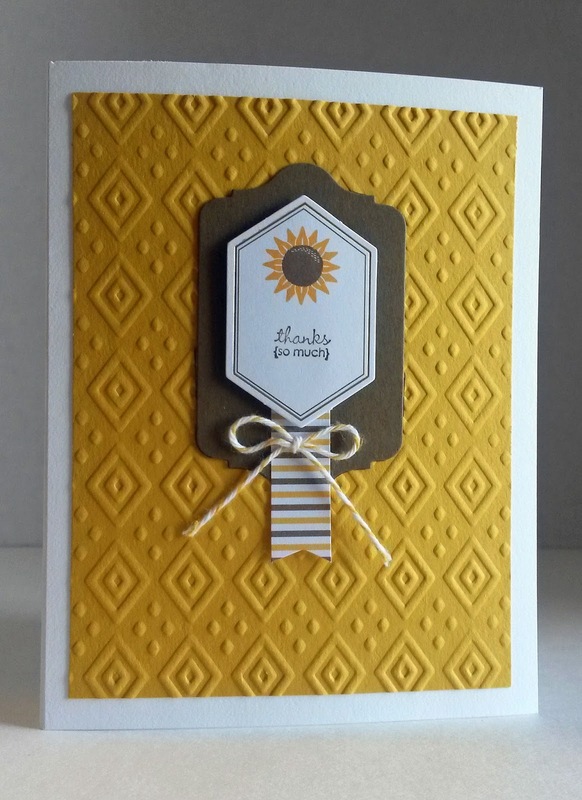 I simply love all the layers this card boasts! Following is the photo from the front of the instruction sheet, showing how the card would look if the instructions were followed. Cute, but not quite substantial enough. Have you given your Paper Pumpkin kit a hug today? a HAPPY and SAFE Thanksgiving. 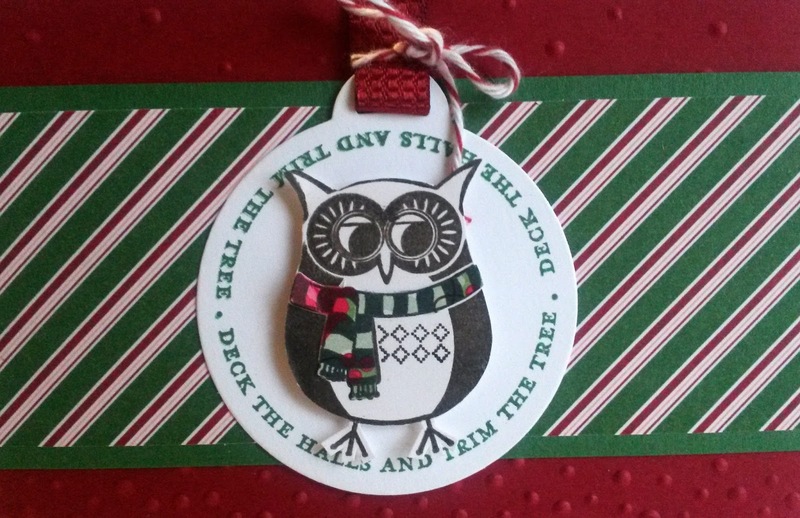 In the Holiday Catalog, which is current now until January 3, Stampin' Up! introduced something new in their lineup of products. On page 13 you can find the Cable Knit Dynamic Textured Impressions Embossing Folder, a mouthful, I know. But it is honestly so cool! It has the most texture and dimension of any embossing folder I've ever seen. Ever since I got my hands on one of these exquisite folders, I was anxious to use it in a card. Since it is a warm and cozy cable knit, that's the type of card I wanted to feature it on. I wanted the textured background to be very prominent and easy to enjoy. But I didn't want it to completely take over the card. I used two of the acorn components from the Acorny Thank You stamp set on page 202 of the big catalog. The ultra wide ribbon is some that I've had from years past and I have always loved it, although I don't get much of a chance to use it. So I called it into play for this fall-flavored card. The ribbon is Chocolate Chip and Very Vanilla. So, to create my acorn, I made the bottom in Chocolate Chip, and since the cable knit was in Soft Suede, that's the color of my acorn cap. Do you love the awesome Very Vanilla tag on which my acorn rests? It is one of the Cheerful Tags Framelits Dies (page 39 of the Holiday Catalog). Except I snipped off the portion that has the big circle in it. That left a cool shape with two slits through which I was able to slip my stripe-y ribbon. The Chocolate Chip swirl-y shapes that bracket the acorn are also from that Framelits set. A little close-up of the fantastic texture. This photo still doesn't do it justice though. You really needd to see and touch it in person. One thing to remember about this embossing folder: If you simply run a piece of cardstock through the embossing folder as you usually would, that's just what you would get: a piece of embossed cardstock. Nice. But not the purpose of this specialized embossing folder. It sounds sort of weird, but in order to get the deeply textured dimension that it was meant to give, you need to SPRITZ THE CARDSTOCK LIGHTLY WITH WATER ON BOTH SIDES before putting it into the embossing folder. The wetness fades quickly. But the extra dimension you get from stretching the paper fibers a little with the water first is AMAZING! One more close-up of the overall texture. Don't you just LOVE it?? My girls created this card at the Stamp-In Workshop I held last week. I had meant it to be a cozy Thanksgiving card, so I encouraged them to choose from among the Thanksgiving sentiments I had to stamp inside the card. Fold a 5 1/2" x 8 1/2" sheet of Very Vanilla cardstock in half, creasing well with a bone folder. Spritz with water both sides of a 4" x 5 1/4" piece of Soft Suede cardstock. Immediately place it inside the Cable Knit Dynamic Textured Impressions Embossing Folder and run it through the Big Shot. Be sure to feed the hinge edge of the embossing folder through the Big Shot first. Once this piece is completely dry, adhere it to the card base. 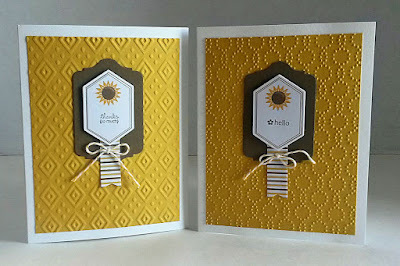 Run a scrap of Very Vanilla cardstock through the Big Shot and cut with the Cheerful Frames Framelit with the hole in the center. Trim off the portion that has the hole. You won't be using that part. Insert a 5" piece of wide striped ribbon through the holes at the top and bottom of the tag. Making the ribbon lay as nicely as possible, fold the top end over to the back of the tag, and secure it in place with a piece of tape. Trim the bottom portion of the ribbon to produce two points. Arrange the ribbon within its slit as you wish. Run scraps of Chocolate Chip cardstock through the Big Shot and create two of the fancy scrolls from the Framelits set. Adhere these to the sides of the label. On a scrap of Very Vanilla cardstock, stamp the cap of the acorn in Soft Suede and the bottom of it in Chocolate Chip. Cut out the two pieces. WHEN CUTTING THE BOTTOM PIECE, LEAVE A PORTION AT THE TOP SO THERE IS ROOM TO ATTACH THE CAP BY OVERLAPPING. Attach the cap to the bottom with a piece of Stampin' Dimensional. 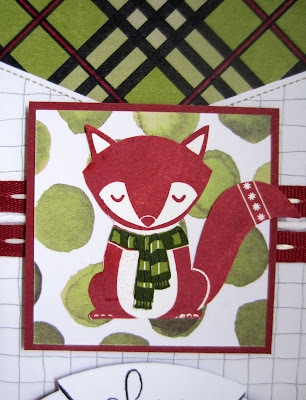 Then attach the acorn to the center of the tag with a Stampin' Dimenisonal. Now, don't you just want to snuggle up in a cozy cable knit sweater in front of the fire with a cup of hot chocolate and a good book? I wish I still had this card in my hands so I could retake photos of it. You see, it honestly is so much prettier in person, and I'd try mightily to capture more of its essence. But, unfortunately, it is now living about 100 miles from me. Tomorrow is my mom's birthday, and this is her birthday card. I snapped a few shots of it before I mailed it out to her. 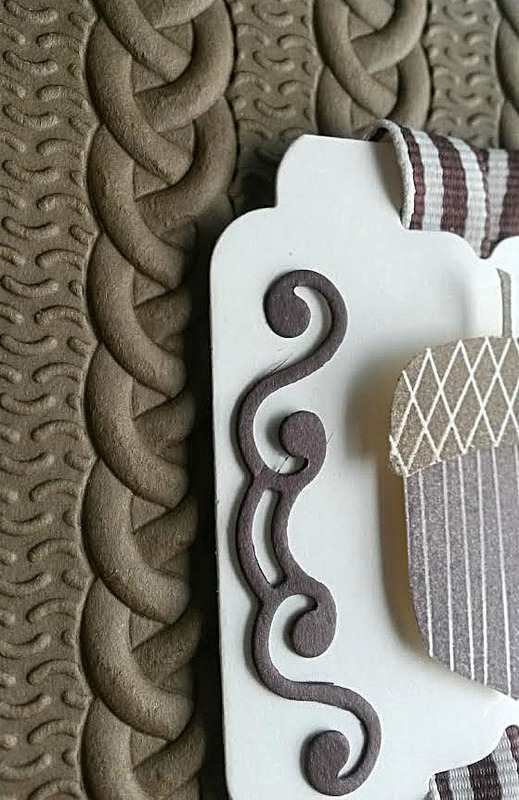 Anyway, this card is an example of emboss resist. 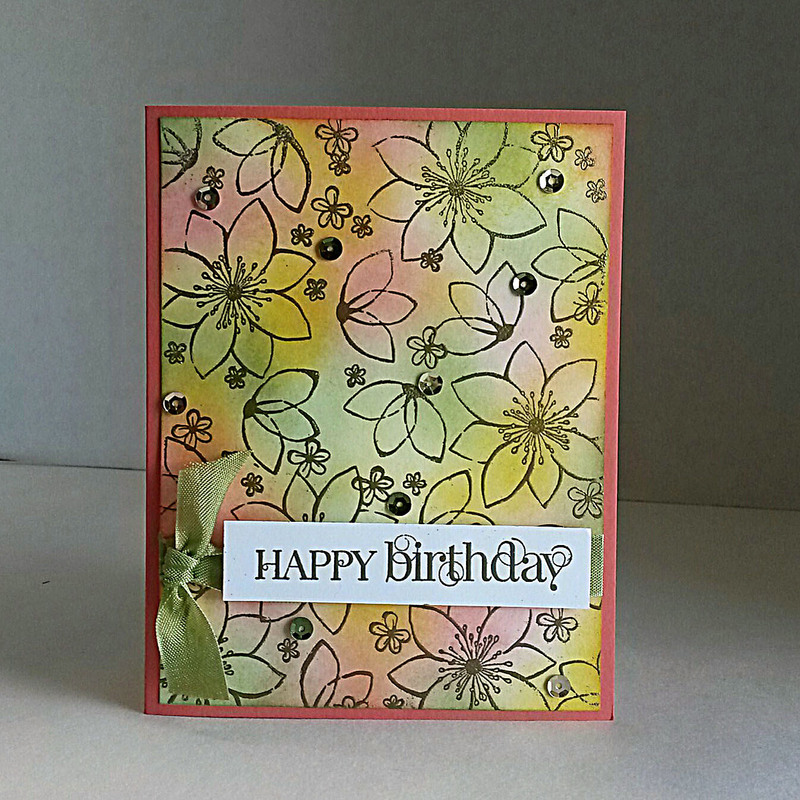 The flowers of all sizes on the card are from a Paper Pumpkin kit from a few months back. I love the large flowers, the half flowers and aren't those two tiny sized flowers adorable? After rubbing my paper well with my trusty Embossing Buddy, I stamped them all over the Whisper White cardstock in VersaMark ink. I added gold embossing powder to the stamped images. Once my background was cooled enough, I sponged autumn-flavored colors all over, trying to vary darks and lights, but blending the colors. Once I had my background sponged, I added a few sequins from this past month's Paper Pumpkin kit to give it a little bit of bling. I'm so sad that the set from which I chose my sentiment is retired because it so so wonderful and whimsical. 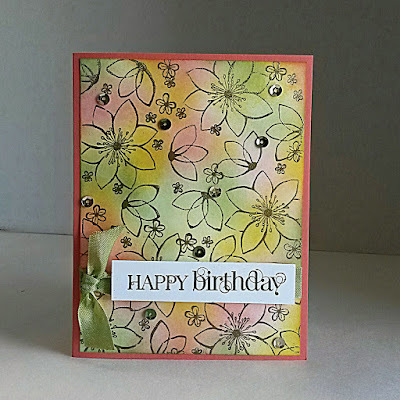 To match the gold embossed flowers, I also embossed the Happy Birthday in gold. My photo doesn't show, but inside the card, I had attached a smaller piece of Whisper White cardstock on which I had gold embossed a nice saying. I even gold embossed my stamped info on the back of the card. I mean, you gotta stay consistent, right? 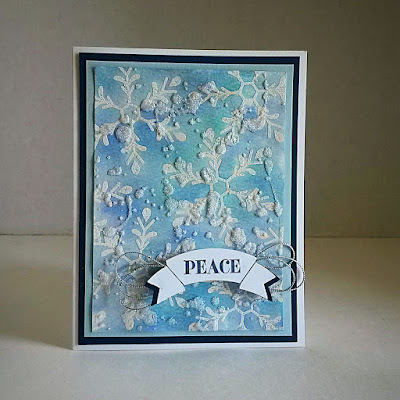 I know I feature emboss resist on my blog quite frequently. It is such a really cool technique and gives the greatest results; it's almost impossible to mess up emboss resist! Do you ever use it? What are your favorite resist methods? Happy Birthday to my dear mom! I didn't use all the components that came with the test tube Paper Pumpkin kit. The little sunflower tags were just begging me to use them on cards, so I obeyed, and set to it. From the kit, I used the sunflower tags and the striped banners, adding all the rest from my supplies. My mom's birthday is this week, so I thought she would enjoy having a handful of cards on hand. So I made eight cards, four of which are just HELLO cards and four THANK YOU cards. I had thought the Elegant Dots would be adorable as the background. However, when I embossed my first one and laid my focal point on top of it, I wasn't totally thrilled with the look. So, what I ended up doing was making two of the thank you notes on that background, as well as two of the hello notes. 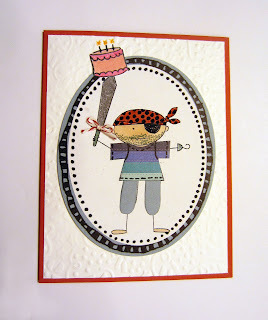 Then, I finished up by doing the same with a different embossed background, the Boho Chic. I am mailing the packet of eight cards and their envelopes, so didn't want to add just too much weight. So, I created a simple belly band to keep them neat and all together. 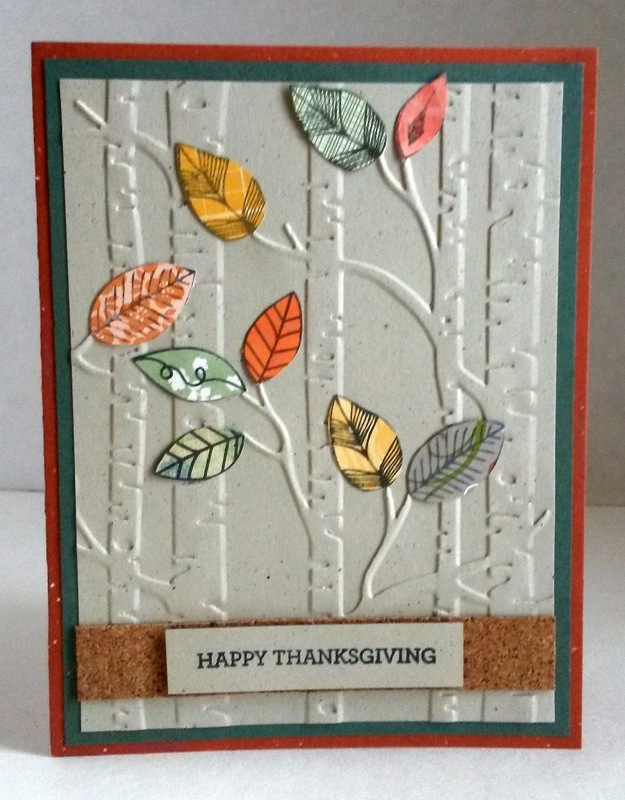 I just love it that Stampin' Up! always provides more components than we actually need to put together the Paper Pumpkin kits. It gives a great opportunity to be even more creative and get more from our supplies! I always take the photos for my blog with my little Canon digital camera, then import them to my computer so I can send them to Photoshop Elements to work with them. This was a difficult card to photograph. You see, it sparkles so much you almost need sunglasses. I took so many photos just trying to capture its beauty that is apparent in real life. Today, however, when I plugged my camera into my computer, there was no communication between the two devices. Uh oh. I know nothing about those kinds of things! I even rebooted my computer, hoping that would clear up any glitch. But no. That wasn't it. The computer just did not recognize the presence of my camera. I had taken a few photos of the complete card with my Smartphone to put up on Instagram. So, that was my only option (for this little pea-brained person). I sent the phone photo to Photoshop and worked with it. 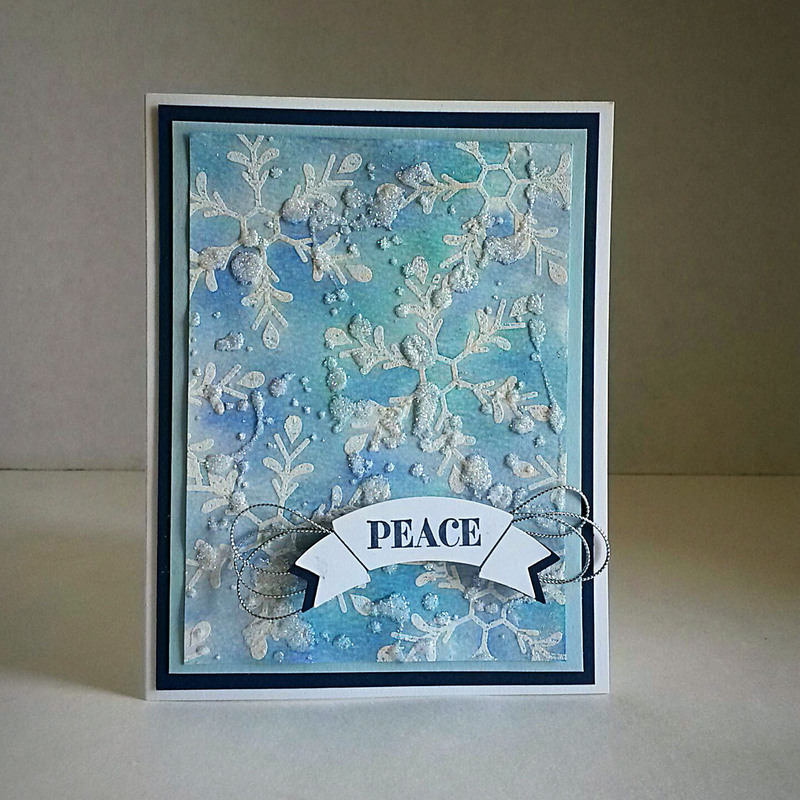 I had been designing this card for an upcoming Stamp-In Workshop. It turned out to be way too frustrating, long and complicated though. So, I opted for a simplified rendition of the same look for the workshop. However, I did like the way this one turned out. So, I thought I would share it with you, and tell you how I did it. If you are interested. I started with a 3 1/2" x 4 3/4" piece of watercolor paper. After rubbing the Embossing Buddy well over the paper, I stamped the snowflake from Holly Jolly Greetings (page 34 in the big catalog) several times in VersaMark ink. At the heat station, I covered all the snowflakes with white embossing powder, and heat set it to emboss. I had added single drops of three retired reinkers to a little paint tray. I then watered down the reinkers with water. I spritzed the watercolor paper well with water so I was working wet-on-wet. Using a paintbrush, I picked up one of the colors and kind of dripped and splattered it onto the wet paper. I repeated that with all three colors, letting the inks run and blend into one another. When you are working wet-on-wet, you need to be very careful about the colors you choose, because as they run and blend, certain color combinations will give you a yukky shade of brown. Since I was using shades of blues and purple, I didn't have any problems with mud. With a paper towel, I absorbed some of the excess ink, started to dry it with my heat tool. Dabbed again. Once it was dry, it was much too light. Remember, I was using very watered-down inks because I didn't want too-saturated colors in any one spot. So I repeated this same process three times until I got the color intensity I really wanted. The white snowflakes had popped through its colored resist beautifully. Then, I was ready to try a sparkly technique I had come across somewhere. Using Elmer's Glue in another of the slots of the paint tray, I watered the glue down considerably with water, and stirred it until it was well mixed together. Then I took another paintbrush and flicked the watered-down glue all over the background. The next step was to add Dazzling Diamonds Glitter to the wet glue spots. It worked well, but the splotches of sparkly glue were much more dimensional than I would have hoped. Even so, I definitely do like the look of it. Sometimes, during a heavy snow, the flakes come down heavy and thick, clumped together. That's the effect on this card. I know you hear this all the time, but you should see it IN REAL LIFE! This photo does not do it justice whatsoever. So, enjoy this single photo of the card. I've wasted enough time trying to figure out these technical difficulties. Hopefully by my next blog post, I will have it worked out. If you have any ideas for me, please let me know! Do you remember the long-ago Stampin' Up! set Ahoy Matey? Well, when that set first came out, my youngest daughter fell in love with it. She proclaimed that every single card I ever make for her for the rest of her life needed to be made with that set. Sarah, now in her 30s, had a birthday this past week. 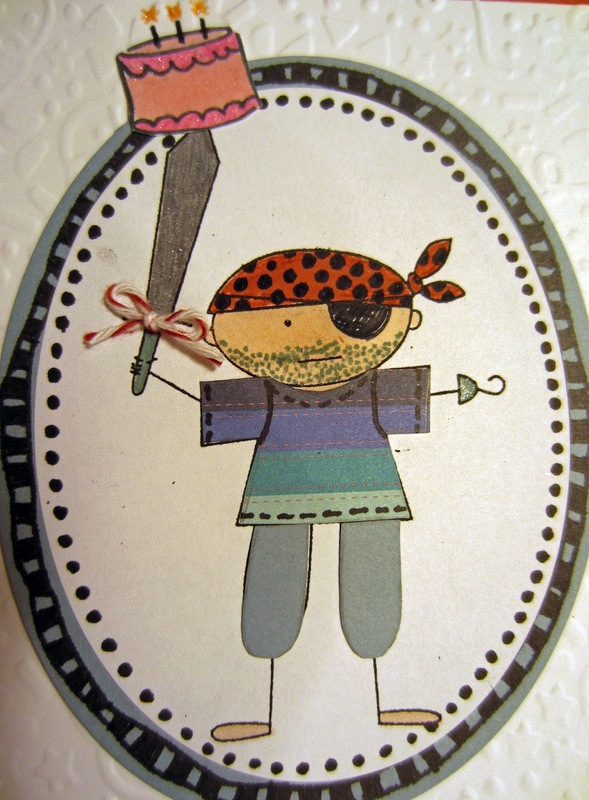 So, of course, I made her a pirate card. 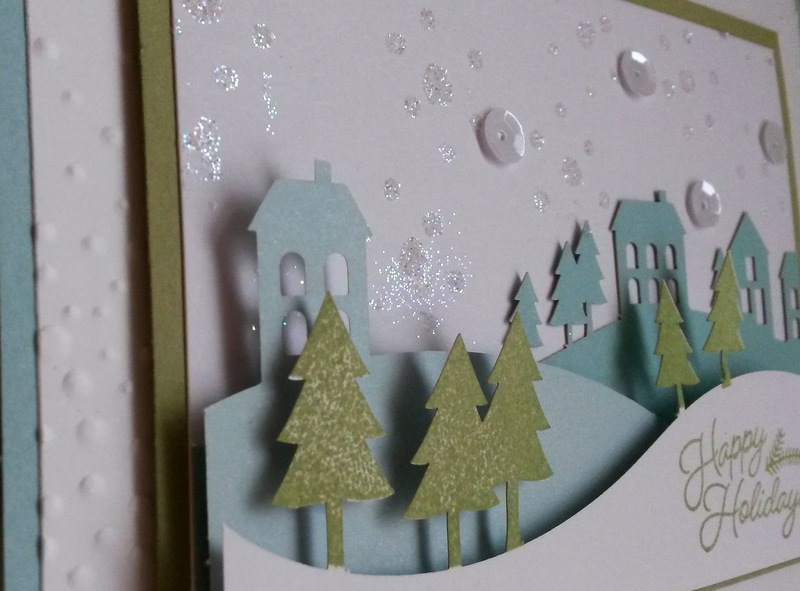 To add to the festive look of the card, I embossed the rectangular piece of Whisper White with the Confetti Embossing Folder (page 195). 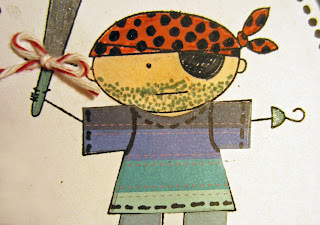 The little guy looked much too clean-cut for a pirate. You know what I mean? So, I added some whisker bristle and brought him up to date. I colored his sword blade and his hook in gray, but made them look a little more metallic -- and festive! -- by adding a bit of Wink of Stella. And, on the very tip is the cake from the Endless Birthday Wishes (page 22). 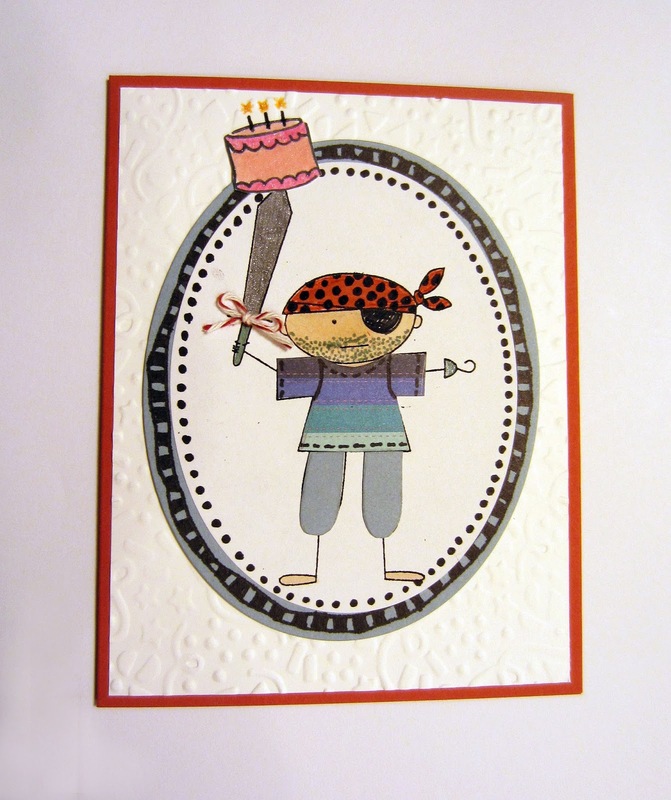 What a meanie, stabbing a birthday cake with his sword?? His shirt is paper pieced and I drew some stitching and arm hole lines on with marker. His pants are also paper pieced. His bandanna is just colored in, but I added some black polka dots. Around the perimeter of the white oval, I markered black dots. And on the gray oval behind it, I used marker to add a checkerboard look. In looking through the Stampin' Up! 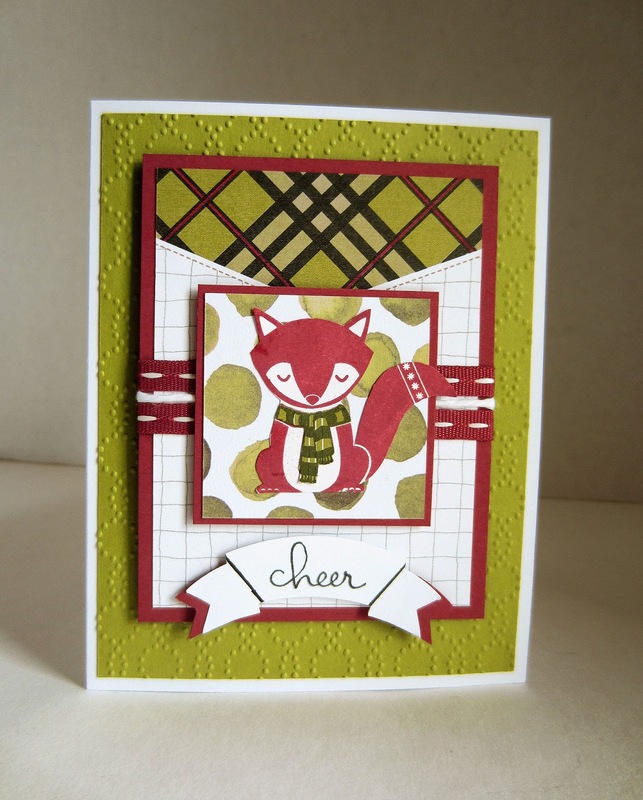 Holiday Catalog, did you happen to notice the precious stamp set Cozy Critters available as a hostess perk on page 3? That wide-eyed owl and the eyes tight shut fox struck me especially. And, the best part is that they are both weating scarves. You know what that means, right? Yup. I stamped the scarves on bits and pieces of Christmas-colored Designer Series Paper that I had in my stash. While riding in the car for long distance trips, I cut these teeny tiny little scarves out. Anyway, I was excited to use one of the foxes, so I stole one from the bunch that are ready for the workshop, and went to work. First, to get some inspiration, I grabbed into my box of Project Life cards, and randomly drew one. I looked at it with absolutely no sense of inspiration whatsoever, and even started to move to put it back in the box. No, Linda! That is the point. A random pick is meant to challenge. So, I reluctantly laid it on my work table and sadly gazed down at it. I had a few Project Life cards left over from other projects that measured 2" x 2". I sifted through them, and discovered one that would be a perfect complement for this uninspiring background piece. Do you all remember the old In Color Cranberry Crisp? I wish they hadn't retired it, because I'd always felt pretty attached to it. 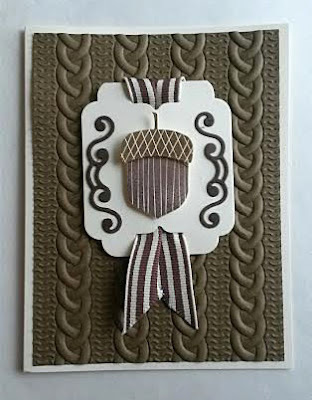 Having ribbon, paper and ink left over in that color, I used it throughout this card, along with white and Old Olive. Even my foxy fox is Cranberry Crisp. Basically this is the Project Life card I'd randomly picked to work with. The squiggly background lines against white and the cute pointed piece of plaid on the top of it. 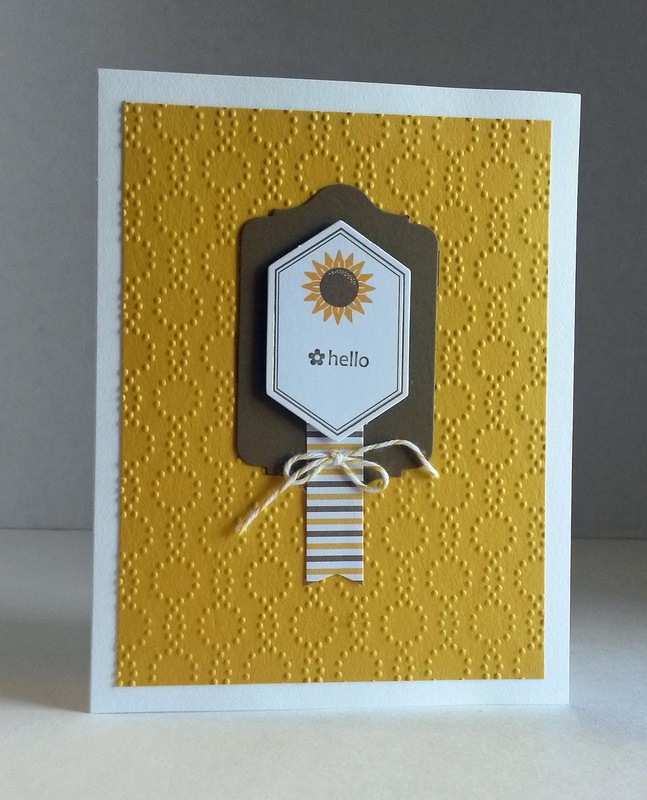 But then the 2x2 piece of Old Olive polka dots against white was just what I needed to make a happy card.